So since I started vlogging about 2 month ago, everyone has been asking me what drone i use, how i get my aerial shots etc. Back in the day, huge cameras had to get inside a helicopter and it would take ages to record an aerial shot for movies. Nowadays, the power of technology has allowed for drones to do that for us. I don't have much knowledge about drones with the exception of the drone that i use personally. Moreover, when it comes to licensing and having a drone license, i am not the person to go to. What i do know is; they are all very expensive courses to take, we're talking more then £1000. The drone license basically grants you permission to use your drone for commission, basically payment. "What drone do you use?" The tile says it all, it's the DJI Mavic Air in White. So the DJI Mavic Air has a very good camera, it has a 32 Megapixel, 4K camera. You can take both Spherical & Panorama shots and many more. It has a 3-axis Gimbal that allows you to control the up-down movement of the camera while in the air. It has a Sports mode that disables the 3-Directional Environment Sensors in order to fly faster. The 3-Directional Environment Sensors allows for better control and stops the drone from hitting objects around you. If the Drone sensors pick up that there is an obstruction in front of the drone's path, it will stop moving forward, an alert will show up on your phone screen. Unfortunately, the only downside with this drone in my opinion would be the battery time, it only has approximately 21 minutes flight time. You're probably reading this and thinking, that's plenty of time, but believe me it is not, the battery power reduces over time without even using it. A two day no-use of the drone will reduce the battery automatically to around 80-90%. 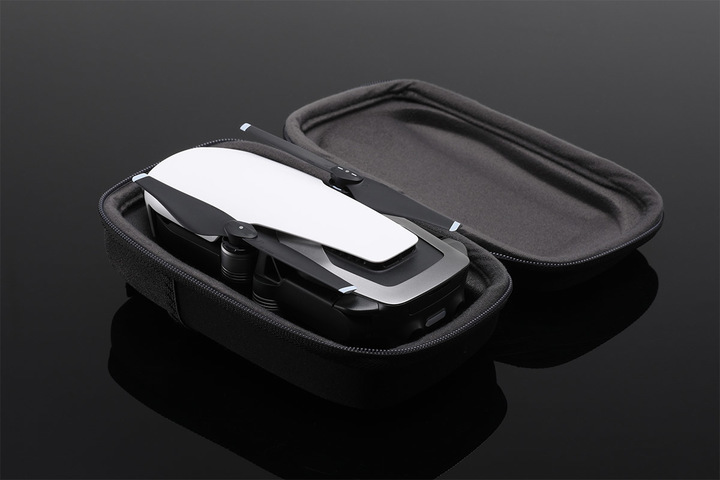 At the cost of reducing size and increasing flexibility, the battery power has been reduced which is something DJI clearly understood and took the risk of. "What purchase pack did you choose?" So Dji offers various packages for each drone that you buy. The Drone by itself with the remote, 1 battery and cables are £769, which is the standard package you'd choose if you were simply wanting the drone and nothing else. If you have a little more budget, i would highly recommend getting the fly more combo pack which goes at £949 and gives you a travel bag, 2 spare batteries, charging hub, spare propellers, propellers guards, spare remote control sticks. "What are the purchase options?" "Is it easy to fly?" Yepp, DJI has made life for every person easy, the mobile app that is used to control the drone together with the wireless remote is very easy to use. I got the hang off it within minutes, it's very straight-forward. If you struggle, DJI does YouTube Tutorials, be sure to check them out! The mobile app keeps updating on a regular basis (Literally). This way, all fail-safe updates are working and improved as well as the front-end side of things: look & ease of use of the app. Your iPhone or Android phone is plugged into the wireless remote part and together they make up the means of seeing and controlling your drone. Do remember that what you are seeing on your phone is a low quality version of what is actually recorded on your drone memory card. "Is it worth the price?" In a nutshell...YES! This is my first drone and i am very happy with it! Naturally, there are better drones out there made by Dji and other companies, but for the budget i had and wanted to pay, this drone provides me with everything i need. Anything more would simply be minor upgrades like increase range or longer flight time by other drones etc. Quality wise, The Mavic Air is right at the top for the price you pay, i mean, you can pay £20k and max out on the specs/accessories for a drone and get the: Inspire 2 but that would only benefit you if you were a professional film maker.